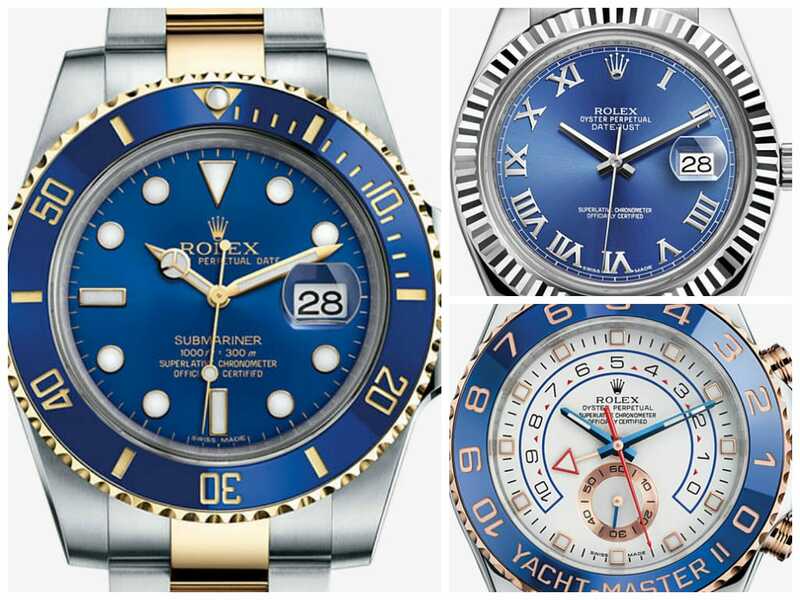 This season, give a nod to the nautical and sail into high style with a blue-hued Rolex watch. From the sporty Submariner Date to the bold Yacht-Master II and classic Datejust II, make a splash with the perfect blue Rolex timepiece. Here is a collection of three watches. The Submariner has been the standard in diving watches since Rolex launched its first model in 1953. This particular model, the Submariner Date (116613LB), certainly stays true to the DNA of the original piece, yet is outfitted with the latest innovations and technical expertise we have come to expect from Rolex. Its 40mm Oyster case is fashioned from Yellow Rolesor – a combination of 904L steel and 18k yellow gold – as is the matching flat three-piece links Oyster bracelet. 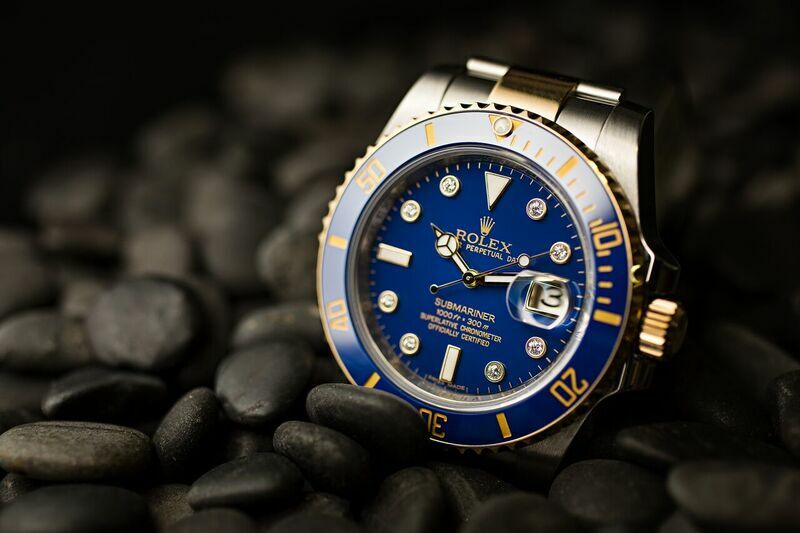 The unidirectional rotatable blue Cerachrom bezel insert in scratchproof ceramic is perfectly complemented by the gold-coated numerals and graduations and is key for monitoring precise diving times and decompression stops. The Chromolight display and blue luminescence on the dial allows for ease of legibility even in the darkest underwater environments. The Submariner Date is powered by the Rolex Caliber 3135 and is waterproof to 1,000 feet. A fitting companion to either a diving suit or a formal black-tie ensemble, the Submariner Date is an essential piece in any modern man’s wardrobe. With the Yacht-Master collection, Rolex sought out to develop a timepiece explicitly for the sport of yacht racing and the Yacht-Master II (116681) is an exquisite model from the line. 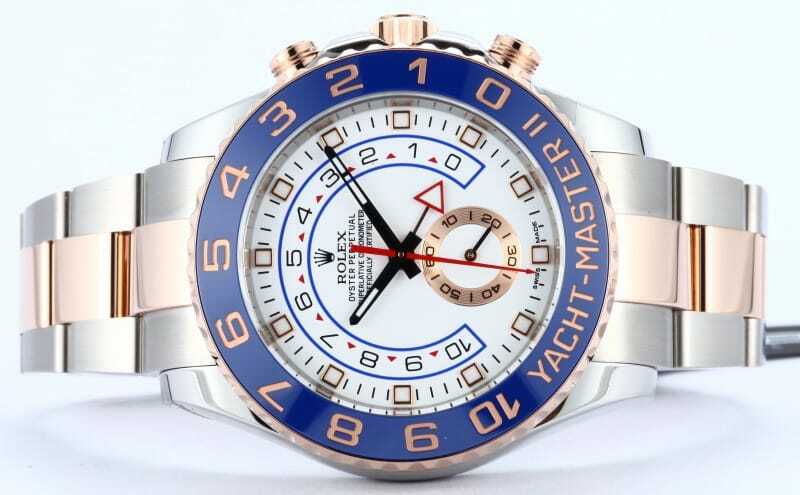 Rolex Yacht-master II Reference 116681 is watch for those active on the ocean. The substantial 44mm Oyster case in Everose Rolesor – a combination of 904L steel and Rolex exclusive 18k Everose gold – is topped off with an 18k gold and blue Cerachrom insert in ceramic with gold-coated numerals. Besides being impressive to look at, the bold bezel of the Yacht-Master II (116681) also serves a practical purpose. Referred to as the Ring Command, this special bezel is actually linked to the Caliber 4161 movement within the watch to operate the programmable countdown mechanism to track regatta race start times. Not only can the countdown be programmed from 1 to 10 minutes, it can also be mechanically memorized and can easily be changed to coordinate with race start time changes. Unapologetically audacious in style and technically complex, the Yacht-Master II (116681) is for the sailor who wants to stand out. The quintessential modern classic watch, the Datejust II (116334) is an updated version of the Datejust with an augmented case size of 41mm. The increased size is perfectly suited to a more contemporary style sensibility and can easily transition from Power Suit Mondays to Casual Fridays. This Datejust is also closely tied to the tennis community. 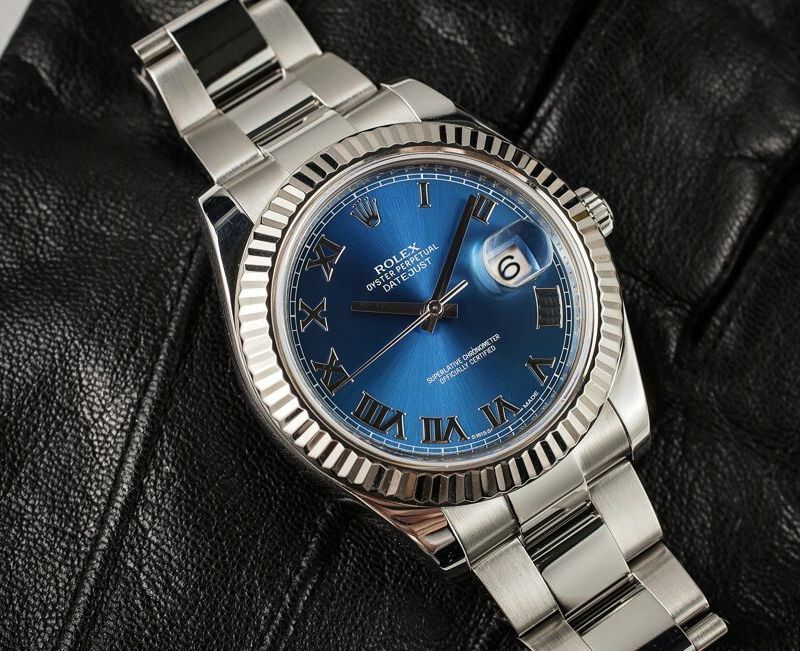 The White Rolesor – a combination of 904L steel and 18k white gold – Oyster case sits in stark contrast with the blue azzurro dial, while the fluted bezel lends the Datejust II (116334) its characteristic look. The 904L steel Oyster bracelet with flat three-piece links and folding Oysterclasp is outfitted with the Rolex patented Easylink extension system to allow wearers to increase its length by 5mm for ultimate comfort. Of course completing the aesthetics of reference 116334 is the magnified date window sitting under the iconic Cyclops lens. The easy elegance of this model ensures that it will remain a favorite among Rolex fans and will never go out of style.